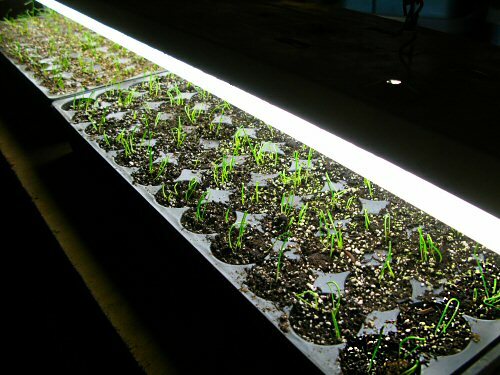 It took a day to sort things out after the move on Sunday, and now the onion seedlings are back in the light racks in the new seedling room, soaking up the cool white fluorescent light. Three trays in all of onions, along with a still-to-germinate tray of parsley, made the little old farm-new farm road trip, and that’s the season’s start so far! Looks great Mike, your days must sure be full right now! How exciting, I wish my onion seedlings were this big now. I need to plant more when I get seeds. I love home grown onions. Ours are going under the lights this weekend although in smaller numbers that you have there. Can’t wait to come out and see the new Tiny Farm when the snow is gone. i never had any luck with parsley germinating until i tried soaking it overnight in a glass of water. now we have tons of parsley! i’ve also heard of people pouring boiling water over the seed and something with salt..not too sure on that one. Your seedlings look marvelous. I have cabbage and spinach and lettuce under lights and am growing microgreens under lights. It is exciting. I can pick the microgreens in one week and they are delicious. Now this is a veggie photo to drool over! Great work my garden blogger friend. Peg: There’s definitely something special about the first seedlings of the year, whatever they happen to be. And then that’s soon forgotten as you’re suddenly swimming in seedlings. Microgreens sound cool. I’ve thought about them since Year 1, especially as a winter crop, but never tried. I wonder what the market is like for them around here, nearer a much bigger town than before? They’re a pretty high-end product, it takes a lot of tiny seedlings to make a mouthful! So exciting to get the season off to a start with the use of a light box. I just use a heated propagator here in England, the days are definitely getting longer now. Hooray! Very exciting! It looks so organized, especially so quickly after the move. Your seedlings have a great start to their lives I think. They really are quite inspiring as to what can be achieved. Do you trim your onions once they get 3-4 inchs tall? I read in a book to do so, but dont know if I should keep trimming. Love your site, full of great info. Mark: Yes, I trim. I posted about that last year: Trimming leeks. It seemed to work out OK, so I’ll be doing it again this year! Mike, are you at the same stage this year that you were in 2009 when this photo was taken? Any changes to the way you’re handling February chores to prepare for spring planting?